The Roanoke Valley is located along Interstate 81, a major north-south interstate running from Canada to Tennessee and ultimately, through connection with Interstate 85, covering the length of Florida. 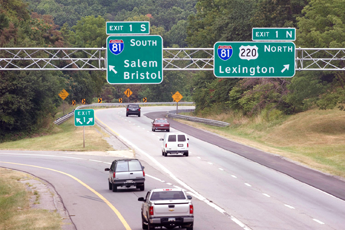 Also running through the Roanoke Valley is US 220, which through connection to Interstate 64 in Virginia and Interstate 77 in North Carolina allows uninterrupted travel to the west coast of the United States and the southernmost point of Florida. Additionally, US 460 runs through Roanoke County, connecting the Valley to Norfolk in the east and Kentucky in the west. Interstates 64 and 77 are within 50 miles of the Roanoke Valley, connecting the area to locations west and south. The Roanoke Valley is equally distanced between New York and Atlanta, putting two-thirds of the United State's population within a days drive.